Stainless steel is an alloy of iron and carbon containing less than 1.2% carbon, a minimum of 10.5% chromium and other alloying elements. 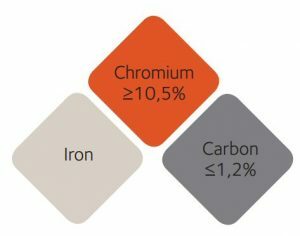 The chromium provides corrosion resistance, enabling natural and continuous development of a chromium oxide surface layer. Referred to as the “passivation layer”, this is self-healing and provides lasting protection when in contact with humidity or water. Corrosion resistance and mechanical properties are further enhanced by the addition of elements such as nickel, molybdenum, titanium, niobium and manganese. The chromium content provides stainless steel with its corrosion resistance, enabling the natural and continuous development of a chromium oxide surface layer. This oxide, referred to as the “passivation layer”, provides it with lasting protection against all types of corrosion. 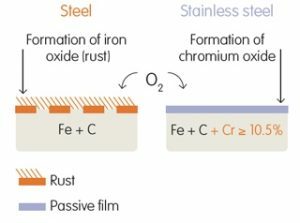 This passivation layer is naturally self-healing when in contact with humidity or water. of other elements such as nickel, molybdenum, titanium, niobium, manganese, etc.